Tonight is our last night on Khao San Road, before we head north on our tribal trek. 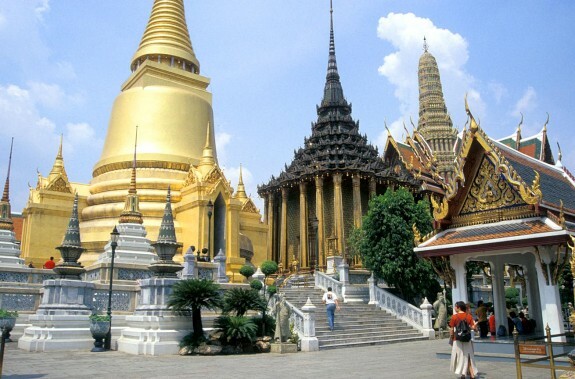 Yesterday we went sight seeing to the Grand Palace and the Reclining Buddah. We got a tuk tuk there which was even more crazy than the cab ride. The Grand Palace was pretty damn impressive with lots and lots of different statues and temples inside. To be honest we were a little confussed as we thought that the grand palace was one building but its the whole area with about 20 different buildings inside, impressive all the same. We also prayed to the emerald buddah in the temple and had to make sure we didnt show the soles of our feet to him. Then we walked to the Reclinging Buddah which is MASSIVE!! She is covered in golden leaf. we walked around the grounds then came back to our hostel as we were sweating loads by this point. Today we went to Siam square, we were originally going to try and go to a floating market but got laughed at by the taxi driver when we asked him to take us there, apparently its not possible to get to the area by car!! We went to the biggest aquarium in south east asia which was pretty cool. We went in the tank on a glas bottom boat and saw lots of sharks and fishy's. We also saw the sharks getting fed and then got a tuk tuk back driven by the thai Michael Schumacher. He was mental!! drving on the opposite side of the road, cutting inbetween buses and cars! !